In Corbett & Ballenger's 12th Annual Denver City Directory (1884), Joseph is listed on page 557, residing at Riverdrive - between 2nd & 3rd Highland. No occupation is given, but also listed at this address is Benjamin H. Rhys, a clerk at Max Huner. Miss Maude Rhys is again listed as a clerk at Daniels & Fisher. Denver City Directories of 1885 and 1886 both also carry entries for Joseph. His occupation is not stated, but his address is given as Riverfront add (sic), Highland in 1885 and Riverdrive, Highland in 1886. There are again also entries for Benjamin and Maud. Benjamin is described in 1885 as a watchmaker, residing at Riverfront add, and in 1886 as a jeweller at Riverdrive. Maud is described in both entries as a clerk for Daniels & Fisher. Her address is recorded as Riverfront on both occasions. The Highland neighbourhood of Denver dates from 1858 when the founder of the city, William H. Larimer Jr. staked out the high ground across the Platte river to the northwest of Denver. This area became home to many American immigrants and as such has a diversity of architectural styles. Today, it overlooks downtown Denver. The population of Denver had increased dramatically in the 1870s following the development of the railroad network that linked it to Cheyenne. After the isolated "Mile High City" had been founded (following the gold rush of 1858) it was initially feared that the railroad would completely bypass Denver - dooming it to eventually fade into oblivion. However, the founding fathers worked hard to raise the profile of the city. They succeeded in establishing a link with the railroad at Cheyenne through the building of the Denver Pacific and other later railroads to Denver. Eventually, the city found itself at the centre of a vast railroad network. The 1890 American census was largely destroyed by fire and neither Joseph nor Ida can be found in the 1900 American census of Denver or elsewhere in America. I also failed to find any record of the sons, Benjamin Howell or John Hamilton using either spelling of Rhys or Rees. Fortunately, the Ancestry.com search engine of the 1900 census allows searches to be made of all individuals - not just the head of the household - which helps when looking for daughters who have probably married. I managed to track down a likely candidate for Maud Matilda - now aged 35, married to Frank F. Cuykendall (a stockman) and living in the township of Roggen, Weld County, Colorado. 1900 was a particularly informative census, listing both the month and year of an individual's birth as well as details of how long they had been married. The year of immigration is also recorded, where applicable. Particularly useful in the case of women is the fact that it lists how many children they have had and how many of these children are currently living. This census records Maud as being born in Wales of a Welsh mother and Welsh father in October 1866 (which matches her civil registration). She immigrated into America in 1872, had been married for 9 years with 2 children - both living - John, aged 7 and Elsie, aged 2. She and her husband also have an adopted son, John Quinn, aged 12 years who was born in Colorado of unknown parentage. Of perhaps greater interest though was the fact that enumerated 2 schedules away from Maud and her family was a widow, Ann Rhys, born January 1842, in Wales of Welsh parents, who also immigrated into America in 1872. This was surely no coincidence - here was the missing Ann - with her eldest daughter nearby! Using this information I searched again for Ann in 1880 (to exclude the possibilty that she and Joseph had perhaps divorced) but was unable to find her enumerated separately - suggesting she might have been mistranscribed in 1880. Another puzzle was that, if this was Ann, the 1900 census recorded her as being the mother of 7 children of whom only 2 were currently living. The censuses of 1871 and 1880 only account for 5 children, but if Ann was mistranscribed in 1880 she and Joseph may have had more children either prior to or after that census. If 5 of her children had died it would also explain why I had so far only been able to find Maud in 1900. The LDS website provided the proof that this was indeed Ann and that she and Joseph had had 7 children. Using the "parent search" facility of this database (and the Rhys spelling) I discovered that as well as the 4 Welsh-born children and American-born, Mary, the couple had also had another 2 sons, born in Denver: Rowland Powell born 17.12.1873 and Roger Howell born 06.01.1876. Both children had died before reaching their 1st birthdays. Tragically, the couple's eldest son, Benjamin Howell had died aged 19 in September 1886, followed by John Hamilton, aged 17 in November of the same year. As of yet, I can find no reason why they should both die in 1886. The brothers had been pre-deceased by their younger sister, Annie Rebecca who died, aged 10 years in November 1881. A master index of miscellaneous Weld County records compiled by the local genealogical societies lists a patents record in the name of "Rhys Anne - wid. of Joseph B", dated 01.08.1895, giving further proof that Ann was mistranscribed in 1880. The LDS website and Denver Death Index both record that Joseph Rhys died 09.12.1893 and Ann herself died in 1909. 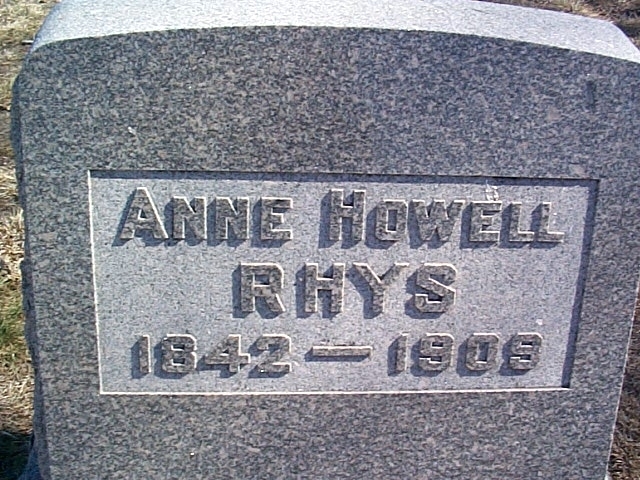 Finally, Ann's grave at Riverside cemetery in Adam's County, Colorado records her name as Ann Howell Rhys. Curiously, Joseph's death is also listed in the Colorado Veteran's Grave Registration Index, although it is unclear which war he might have fought in. This Index also records that he too is buried at the Riverside Cemetery, but no details regarding him are included on Ann's memorial stone. Is he buried at a separate veteran's site? The 2 children who survived Joseph and Ann were the eldest, Maud Matilda and the youngest, Mary Gwenllian. The township where the Rhys family eventually settled, boasted a population of only 68 in the census of 1900. Originally known as Blair, Roggen (pronounced Rog-un) had been established in 1883 and was situated about 47 miles from Denver and 25 miles from the county capital of Greeley. In 1900 the main occupation of it's citizens was ranching - raising mainly cattle and some sheep - in a climate described as being dry and mild. It was perhaps Ann's background experience of farming, together with her son-in-law, Frank's occupation as a stockman, that brought the Rhys and Cuykendall families to this fairly isolated community. The business venture may also later have been partially funded by Ann's bequest in her father's will, following his death in 1895. Intermittently between 1896 and 1902, entries in the local Greeley Tribune newspaper - mainly under the "Country Correspondence" section, give some details of the Rhys and Cuykendall families lives in Roggen. (This newspaper database is a work in progress, which is being constantly updated and may soon yield further information about the families). Reference is made to them jointly and separately, hiring ranch hands and undertaking farming tasks such as dehorning, sinking wells and erecting windmills. By this time, Joseph was dead and Ann appears to have taken over the running of their homestead/ranch. Several references are also made to the social as well as business activities of "Mrs Rhys" and her daughter, Mary, who appear to be quite active and prosperous. From November 1897 onwards some concern was voiced for Ann's health after she suffered "a slight attack of heart failure" which forced her to consult her family pysician, Dr. Stedman in Denver, but by 24th January1898 she is reported as "feeling better". Ann's youngest daughter, Mary (a teenager) is recorded in the late 1890s as teaching at Sunday school, playing the organ and piano, singing solos at concerts and entertaining friends. On June 11th 1902 Mary is reported as having graduated as a teacher from the Normal School of Greeley, following which she apparently took up a post as teacher in Greeley's District 13. However, soon after, on 23rd October 1902 the Tribune further reports that Mary has resigned her post due to her mother's illness. From this time onwards she appears to have helped Ann to run the family business.